The Wombats have not spent a great deal of time acknowledging each other in their lives thus far. They spent almost 100% of their day within a foot or two of each other but the most interaction they have really had is just when they occasionally kick or swat at each other with their wild, flailing, seemingly uncontrollable appendages. Usually Martin is the swatter with poor Elliott being relegated to the swattee position. Yesterday morning, however, things took a different turn. Elliott somehow located Martin's ear and grabbed onto it so tightly I thought that when we finally pried his grubby little hands off of Martin's ear I thought there may be a diamond in his palm like that scene in Superman III. Strangely Martin didn't seem to mind that his brother had a pincer-like grip on his ear. Let's face it though, even if he was crying we would have had to take a moment to get some pictures before coming to his rescue. We're like photojournalists that way. 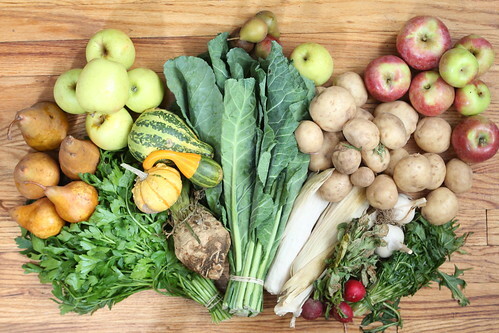 After I headed to work Jen picked up the weekly share. This week we got a bunch of mizuna, four pounds of potatoes (we were able to swap a head of cabbage to double our allotment since the boys don't seem to tolerate cabbage particularly well), a bunch of parsley, a bunch of collard greens, a bunch of radishes, a head of celeriac, two cobs of pop corn, Bosc pears, Golden Delicious Apples, Spartan Apples, and some ornamental gourds. Today was a rainy day but the Wombats took a terrifically long mid morning nap, ate, then fell asleep on our afternoon walk and slept again in their car seats on the couch for three hours. It's always a mixed bag when they sleep for that long. On the one hand it gives me a tremendous amount of time to get things done. Yet still I was not happy about it and after an hour wanted them to wake up so that I could play with them. Tomorrow it will not be rainy and, perhaps, the babies will be awake and fussy all day and I will long for the sleepy afternoon we had today. There is no satisfying the amateur parent. For dinner I made this soup with onion, garlic, butternut squash, potato, and onion, all from the farm. 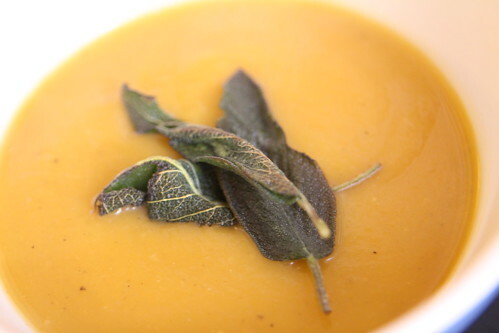 I pureed it all with some vegetable stock and topped it with fried sage leaves. 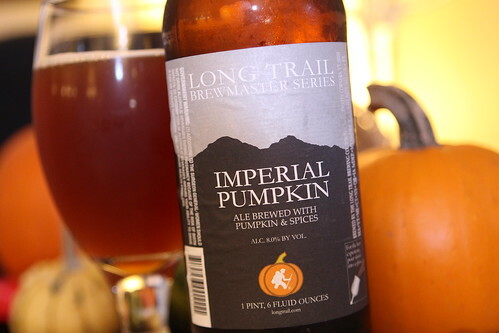 For beer I cracked open this Imperial Pumpkin from the Long Trail Brewing Company Brewmasters Series. It had a malty flavor reminiscent of a Belgian Dubbel, a first in this season's pumpkin offerings. We've got quite a few more pumpkin beers to go but here are the standings so far . . .
For dessert I took some old tart dough out of the freezer, rolled it out, then made a sauce with butter, brown sugar, Lyle's Golden Syrup, and bourbon. 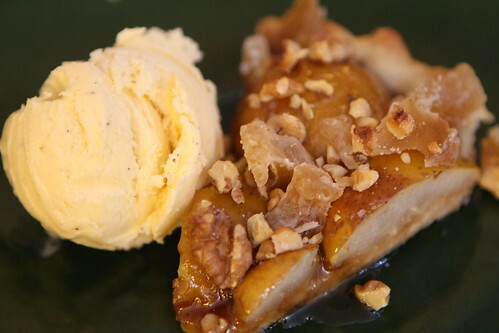 I cooked the halved Seckel Pears in the sauce, added it to the tart dough along with crystallized ginger and walnuts. I served it up with some vanilla ice cream. The end result was pretty tasty. However, after a sleepy twelve hours or so, the Wombats decided that they would pick dinner time to kick up a tremendous fuss. Much of this evening has been (and will be) spent feeding the babies tiny amounts one-by-one while watching old episodes of Scrubs. While the babies fuss it is comforting to be reminded that Scrubs was once actually a very good show. And the cries of the babies help to drown out my own sobbing during the Ben Sullivan episodes. Damn, those episodes are so real! Labels: babies, beer, Dessert, How'd we use it?